Join Indigenous Business people, Indigenous not-for-profit leaders and our supporters, for an informal morning of networking and relationship building. 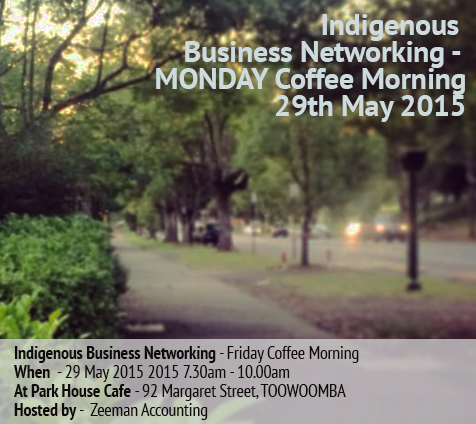 The SEQICC and co-host Zeeman Accounting will meet at the Park House Cafe at 92 Margaret Street, Toowoomba on FRIDAY morning 7.30am – 10.00am on 29th May 2015. Feel free to pop in for ten minutes or stay for 2 hours! Check out our Indigenous Business Networking – Friday Coffee Morning Photo Album on the SEQICC Facebook page. The event is free each week, you just pay the cost of your transport to and from the event, plus the cost of your coffee and/or breakfast. Would you like to be a co-host? Read more at our Hosting Guidelines. For more event information, please contact Leesa. Keep up to date with events via Twitter and the Facebook Event.